I love tots a tot. In college, I’ve had many meals of just tots and mustard. It’s a mystery to me why I waited this long to go on an Austin tot tour. But I did it. 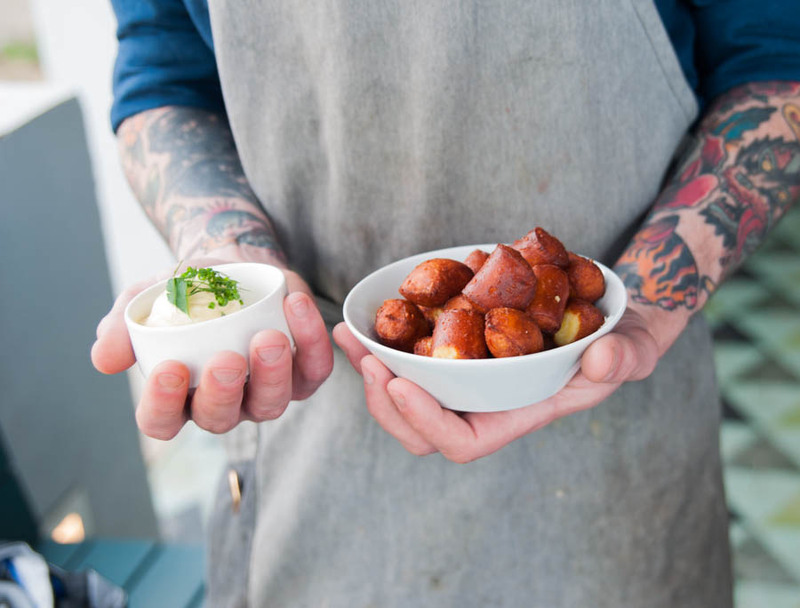 I researched and crowdsourced, and am happy to present to you my list of best 12 restaurants that pay great tribute to the humble potato nugget. There are food trucks, sit-down restaurants, and sports bars in this tot guide. My hope is that there’s a tot out there for everyone! The Longanisa (lon-ga-NEE-sa) Tots from Filipino food truck, Be More Pacific was one of my most unique experience during my tot tour of Austin. Longansia is Filipino pork sausage. According to Be More Pacific’s website, it’s the national sausage of the Philippines. 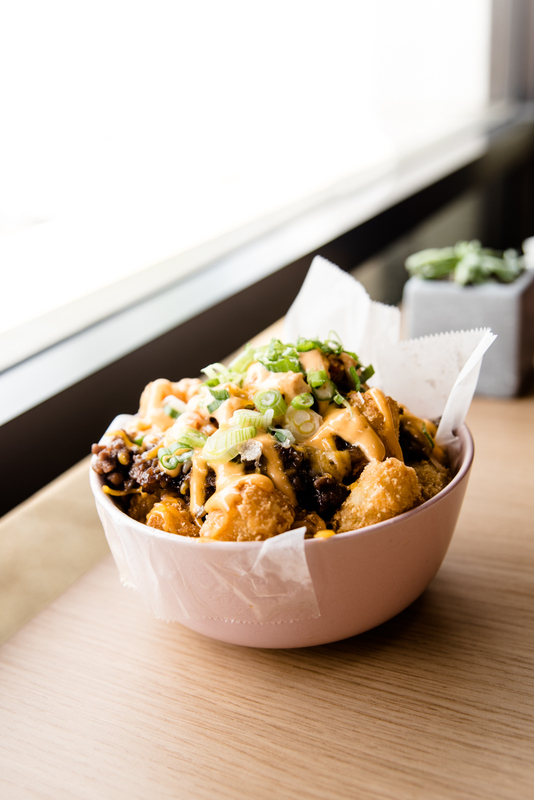 Their Longansia Tots are crispy tater tots topped with melted cheese, crumbled garlicky sweet longanisa pork sausage, and spicy plantain sauce garnished with green onion. The plantain sauce is often called banana sauce. My Filipino bestie has told me about banana sauce but I had yet to experience it until these tots! It tastes like a sweetened ketchup sauce. Tot Tip: Experience the rest of their menu! I recommend their pancit if you love noodles! I was tipped off about the brisket cheddar tater tots at East Side Tavern and envisioned tots that are topped with cheese and brisket. 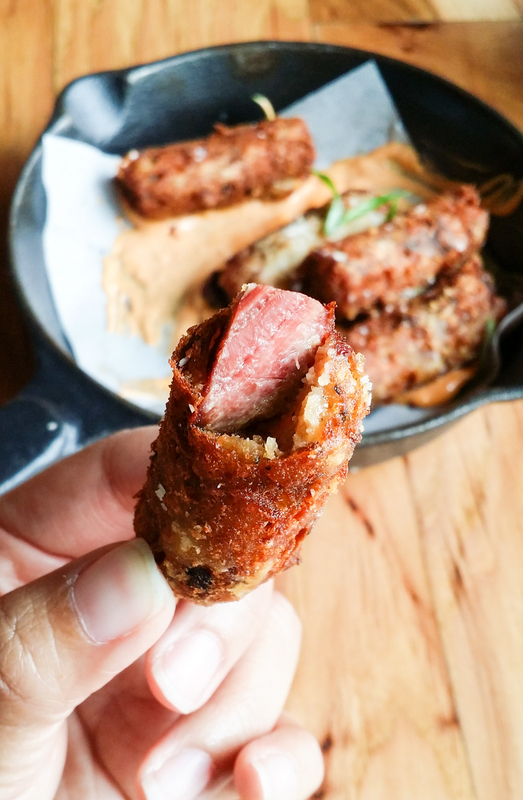 To my pleasant surprise, these hand-formed tots are actually stuffed with cheddar and brisket! Talk about next level tots! They are served with a chipotle aioli. Oh man. 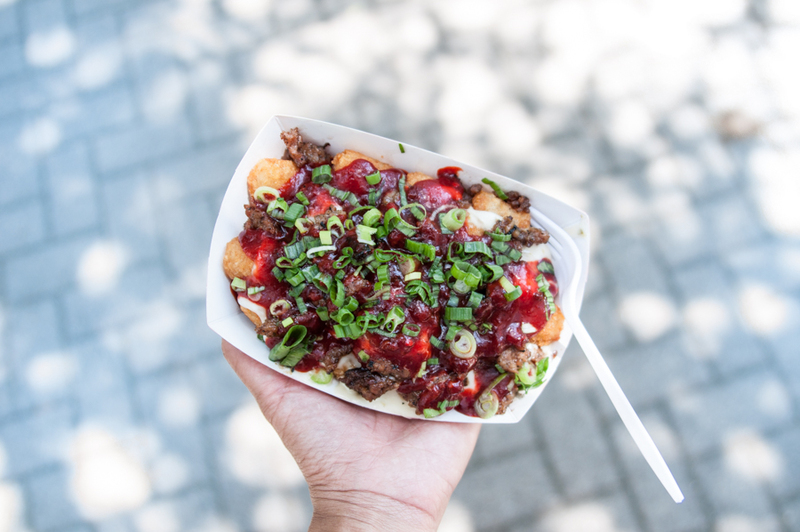 These bulgogi tots from 101 by Teahaus were so good. They’re smothered in kimchi, ribeye, and cheese. 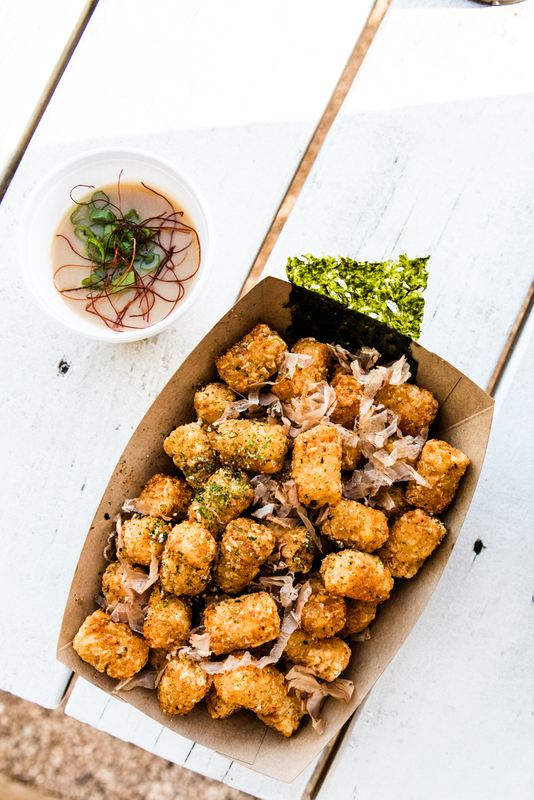 I could munch on a bowl of these tots and their basil popcorn chicken and make a meal out of it. Tot Tip: Save room for their bubble tea and desserts! I’ve been a long time fan of Soursop and they always blow me away with their innovative menu. Last year it was their pho-tine fries. This year it’s their dipping tots, tsukemen style! Tot Tip: Soursop is located at St. Elmo’s Brewery. 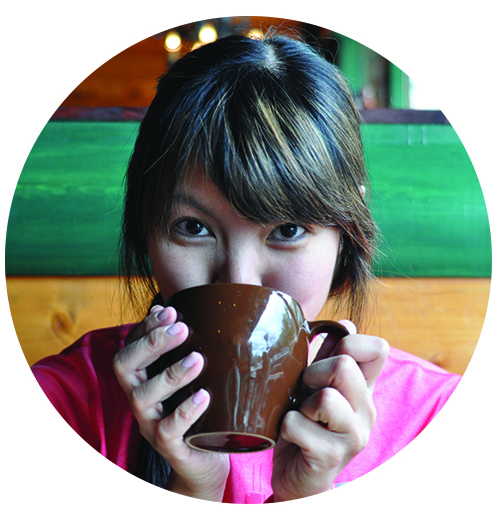 So come to enjoy their always changing and creative menu with some brewskies. If you’re extra lucky, there might be some live music. We’ve all enjoyed kimchi fries, but have you had kimchi tots? 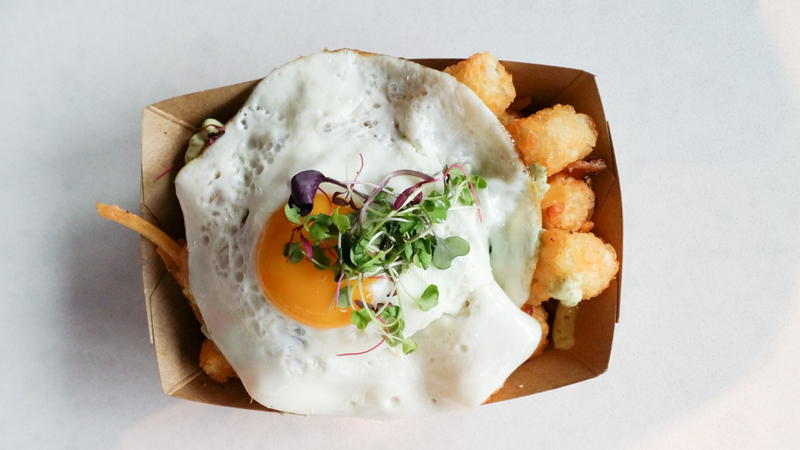 Kung Fu Saloon does brunch now and on their menu is kimchi tots! It was after trying their kimchi tots that I decided to officially embark on a tot tour. 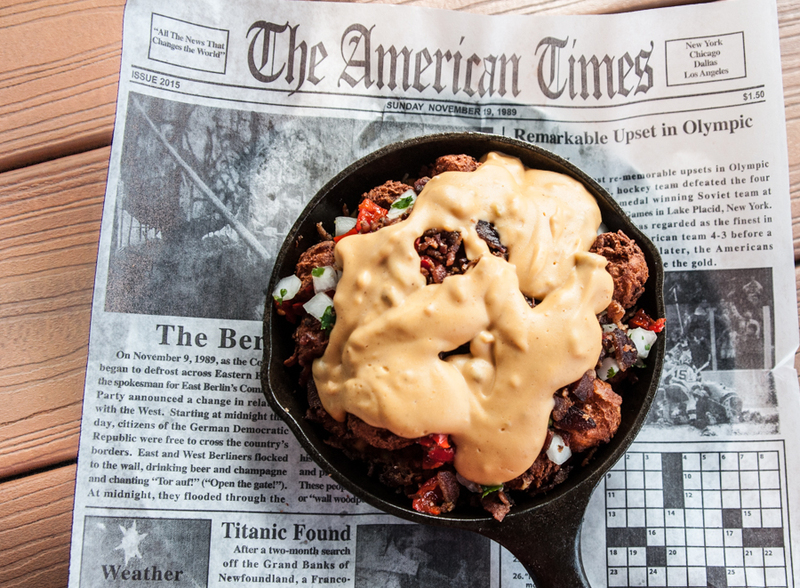 Their tot dish has scrambled eggs, bacon, cheddar cheese, Korean ribeye, smoky queso, and kimchi. Austin Taco Project in the Downtown Hilton Hotel has a poutine tot appetizer! 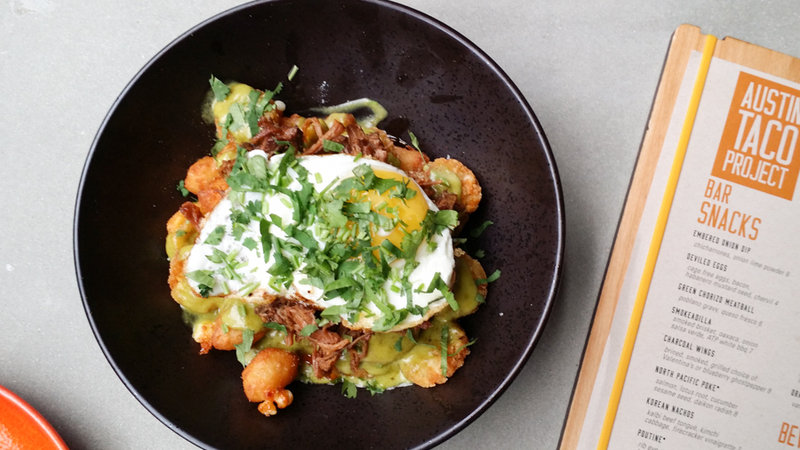 It features ribeye cap barbacoa, tater tots, fried cheese curd, poblano gravy, and a sunny side up egg. Now you don’t have to decide between Taco Tuesday and Tater Tot Tuesday. They can peacefully coexist! Tot Tip: They open for dinner starting at 4 pm! Speaking of tacos and tots coexisitng, another happy place for both tots and tacos, is Velvet Taco. A few years ago I was in Dallas for a weekend and standing in line at Velvet Taco. I said something to my friends about wanting to try their tater tots and the man in front of me turns around and his eyes bugged out and insisted that they’re amazing. People who light up over tater tots are basically my kindred spirits. Hat tip to Patrick from Velvet Taco line. Lucky for us in Austin, Velvet Taco opened up recently in the Domain in Austin! 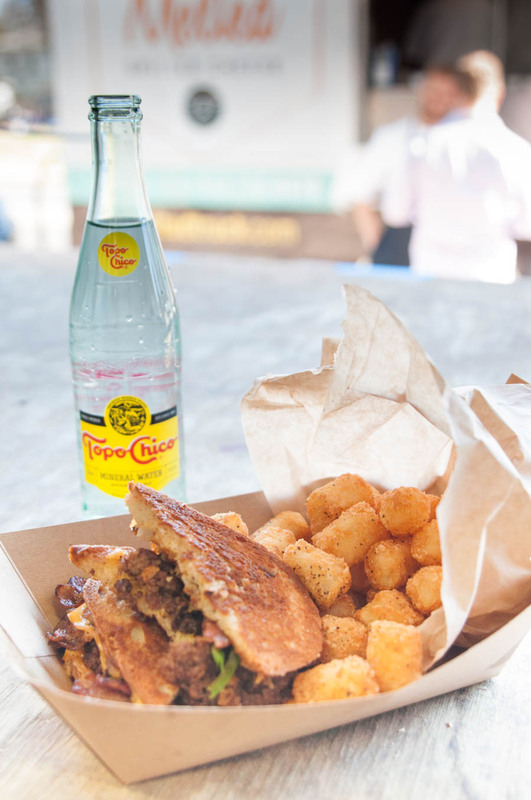 Their specialty are fun tacos inspired by cuisines around the world, and their tots are spot on. They’re topped with goat cheese, smoked cheddar-basil crema, bacon crumbles and a fried egg. I mean, come on. The Posse East is a divey classic on the Univeristy of Texas campus. 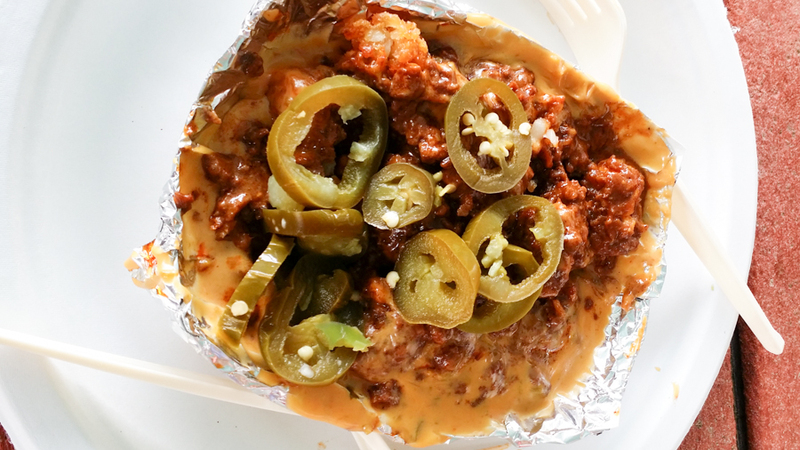 There’s something about eating greasy and gooey queso chili tots in a campus dive. 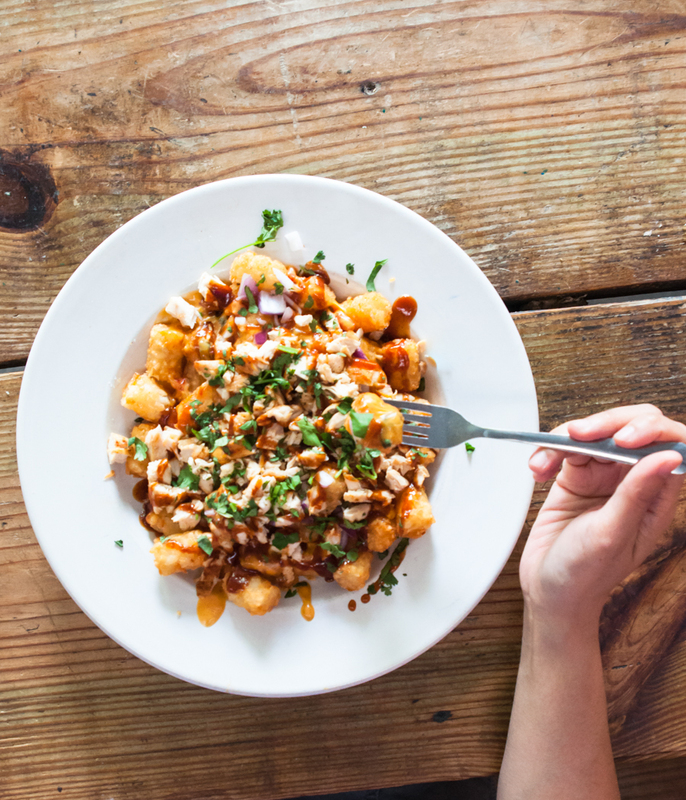 Get a pitcher of beer, order a few orders of the queso chili tots, and enjoy the patio! Tot Tip: You can grab jalapeños from their condiment corner. I’m so glad Juniper’s brunch menu isn’t readily available as takeout or every Friday and Saturday night, you’d find me on my couch with 3 orders of their Potato Puffs in my lap as I binge something on Netflix (currently Orange is the New Black)! My long love affair with tater tots definitely plays towards my down home and comfortable palate. That said, I can appreciate a sophisticated spin on this classic comfort snack, and these “potato puffs” are an elegant and velvety whipped version of my down-to-earth favorite. Speaking of campus eats, I hadn’t been to Plucker’s in over ten years when I was a student at UT. In the course of this tot tour, I’ve gone twice in a week and ordered their totchos twice. Chicken, barbecue sauce, cheese, on tots! I’m going to be bold and say it. Totchos are way better than nachos! Tot Tip: They have a ridiculous Bloody Mary. Can you go wrong with a jalapeño beer cheese? I don’t think so. These handmade tots is sprinkled with crispy bacon and then indulgently smothered with jalapeño beer cheese. Alongside some of Luke’s Inside Out’s delicious brunch entrées you can get a side of his Tater Tot Hash. I’m so happy his tater tot hash led me to his trailer and brunch offerings! I have my eye on his Szechuan Chicken and Waffles with Brie for my next visit. 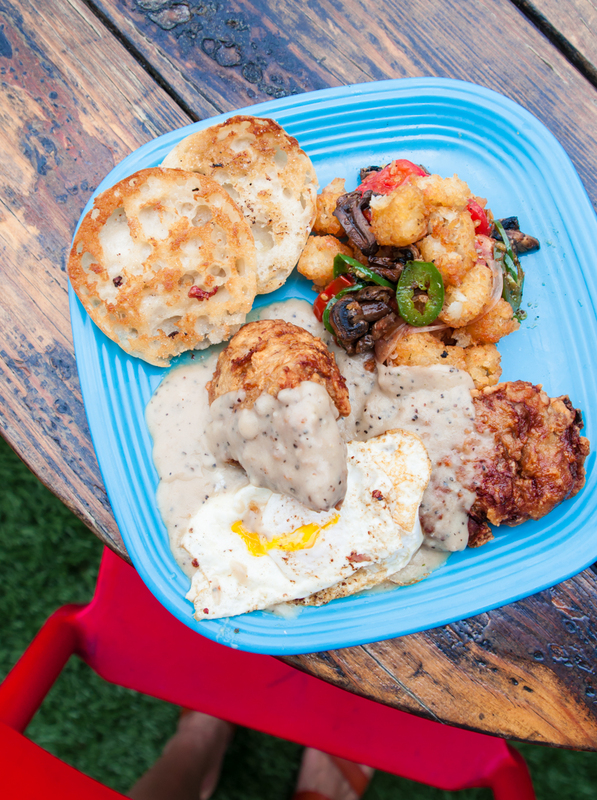 Tot Tip: Tots are only available during brunch and brunch is only on Sundays! 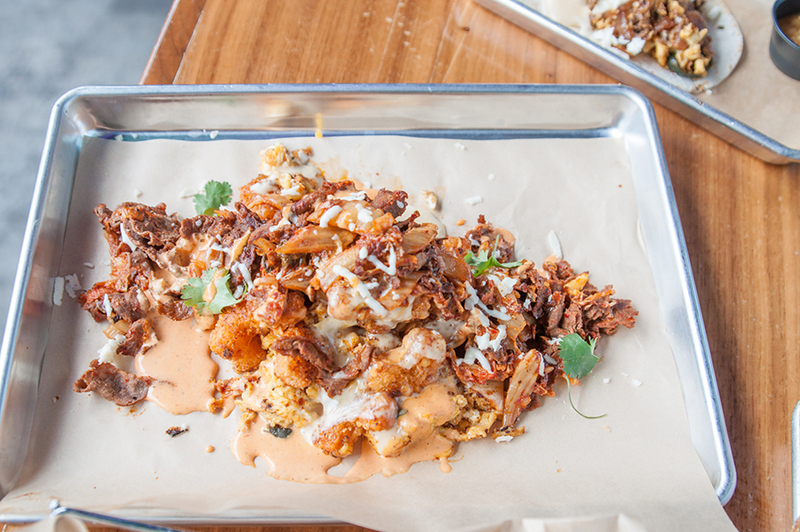 Though Melted’s Sweet Potato Tots and Truffle Aioli are the simplest tots in this round-up, they’re pretty addictive. They also contribute to a great cause as 100 percent of the profits from Melted Truck goes to benefit International Justice Mission. And there you have it. My tot round-up. Did I miss any of your favorites? Previous article Review of Middles, Stuffed Breads with Tasty Middles!